As Dan mentions, there are metal templates in the storage locker that you can use to trace the large arrow emblem for scroll sawing. If you can’t find them, the .PDF file has a pattern (you have to print it on three 8.5x11 pages and tape them together / cut the pattern out). 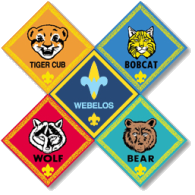 If you haven’t already, you’ll want to gather up the list of all the ranks, arrowheads and webelos pins earned for each boy, as those translate into stripes on the arrow shaft. Attached was the listing I used for our last round. I think there were some leftover arrowheads, paint, and stain from ours that I put together in one walmart bag in the storage locker (I’ll check my basement and garage as well). Sinew (the sticky string for lashing the arrowhead onto the shaft) and feathers I got at Hobby Lobby. Lastly, you are more than welcome to drop by and borrow my boys’ plaques to use as a reference – I know it helps to see a finished one while you’re working on new ones. If you’re really not sure how to go about it, let me know when you plan your first working timeslot with the parents and I’ll be glad to stop by and help you get going.